Blown fiberglass insulation shares the spotlight with cellulose insulation when it comes to adding new insulation in unfinished attics. Different names are used this type of insulation. It’s sometimes referred to as “blow-in” rather than "blown" insulation. Both cellulose and blown fiberglass insulation are also sometimes called "loose-fill" insulation because of how they’re applied. Many attics don’t have adequate insulation. For example, the Dept. of Energy recommends at least an R-49 insulation level in the attic if you live in New England. But many homes have just R-19 or so of attic insulation –in the form of 6-in.-thick fiberglass batts placed between attic floor joists. By combining attic air sealing (see below) with an attic insulation upgrade to recommended levels, it’s possible to cut heating and cooling expenses by 40%. For many folks, cutting your heating and cooling expenses nearly in half is too good an opportunity to pass up. 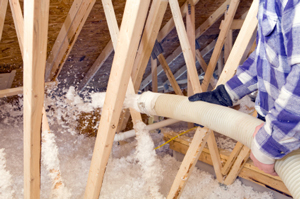 When you upgrade your attic blown insulation with blown fiberglass insulation in Connecticut, the insulation contractor will bring a long, flexible hose up into the attic. The hose is connected to a blower unit down below that shreds large bales of fiberglass insulation and then supplies the hose with light, fluffy material that can be installed right over existing fiberglass batts. Insulation slows heat transfer, but it won’t stop energy losses caused by air leaks. That’s why air sealing is always done before an insulation upgrade. In the attic, technicians will move existing insulation aside in order to seal gaps, cracks and other air leaks, using spray foam and other products. When air sealing is completed, existing insulation is replaced and new blown insulation can be added.